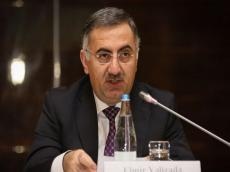 Azerbaijan has become the main transport center of the region, Elmir Velizade, Deputy Minister of Transport, Communications and High Technologies, said when speaking at the Baku summit of the Alliance Conservatives and Reformists in Europe June 9. The deputy minister noted that modernization of infrastructure and legal framework, and improvement of the quality and availability of services constitute the basis of development of Azerbaijan's transport sector. "Today we are observing the development of the transport sector in Azerbaijan. The country, located at the intersection of East and West, North and South, is the initiator and participant of such international transport projects as, for example, Baku-Tbilisi-Kars. New opportunities in transport and logistics for the region are also created by the new Baku International Sea Trade Port," Velizade said. The deputy minister noted that the modernization of the aviation sector will also be continued in Azerbaijan. "Today there are six international airports in Azerbaijan. It is planned to purchase new aircraft and expand the geography of flights," Velizade said.